Evidence for metalworking from Trench 1, Bone Passage - July 2004. The excavations in Trench 1 provided evidence for metalworking at the High Pastures site. All of this material was recovered from the layers above the paved floor and included larger artefacts as shown in the images below, and microscopic material such as hammer-scale. 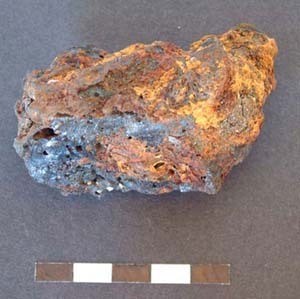 The slag deposit shown above is rich in iron and may be the remains of a ‘bloom’ from the manufacturing process. Further excavations on the surface above the cave may reveal evidence for the smelting hearth where this material was produced. The results of the geophysics survey carried out in December 2004 has highlighted several areas around the site where such activities may have been carried out and we hope to target some of these with trial trenches during 2005. 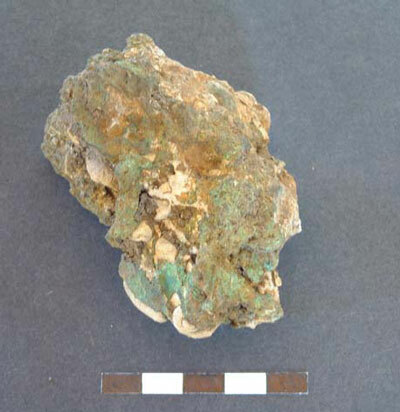 Evidence has also been recovered from the site for the processing of copper alloy - the image below shows drops of this material on a piece of rock. However, sites producing evidence of copper-alloy metalworking activity are relatively rare in Scotland, so we shall be looking for other items during our investigations of the High Pastures site that may shed light on these activities. In particular, we shall be looking for fragments of clay moulds, from which items would have been produced, or for crucibles - in which the metals would have been melted. 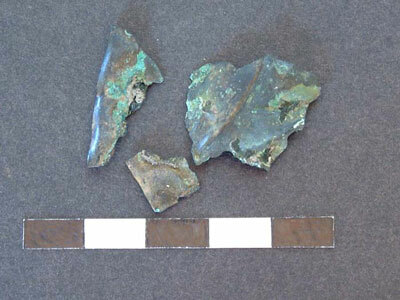 Trench 1 in the cave has also produced fragments of copper alloy, two of which refit back together. Comprising thin sheet with possible decoration, these may have been some form of decorative fitting or attachment (see image below). The image above shows the copper-alloy fragments recovered from Trench 1, Bone Passage.